Since recently discovering that my phone is resistant to water and very loud, I’ve taken to listening to music in the shower. Not owning a purpose-built bathroom audio appliance, the only other option is to open the door through to the kitchen and use that whole room as a sort of giant speaker. 3-minute pop shower: erm, McFly? I’m aware that even by the standards of a blog where the first proper post was a picture of some pasta, this is kind of inane. I’ve just finished an arrangement of Elgar/Parry’s lovely socialist hymn, ‘Jerusalem’. This somewhat confused adaptation was part of a last minute effort by Steve Wright and myself to provide patriotic material for one of the gigs on LUU Dance Band’s 2011 tour of France — the gig happened to fall on St George’s Day, so the enthusiastic and numerous ex-pat community of Bergerac had requested that Jerusalem and Land of Hope and Glory be played that night. We forgot about it until a week before the tour, during which Steve was very busy with other things, and fun ensued. I hope soon to upload an export or recording of Steve’s wonderful jazz-waltz setting (yes) of the latter tune, but for now here is an export of Jerusalem using the Sibelius 7 Sounds library. Due to a minor bug and the fact that it was made in Sibelius 6 originally (I think), the inbuilt export chopped off a few notes, so I used the terrifying and excellent Audio Hijack Pro, a great Mac application that is able to steal the audio from any program and record it to a file. There were lots of good teachers at my old school. It seems to happen that we look back at teachers and various other figures who (generally speaking) tried to help us out when we were young, and realise that we didn’t appreciate them as much as we do now. That’s probably natural — it’s hard to realise you’re being offered a good deal until you’ve had the experience of being offered other ones, or not being offered them at all. Despite that, there were a few teachers who, even at the time, we knew were something special. One of them was Mark Richardson, who is an English teacher at Beverley Grammar School, a state comprehensive near Hull. He had such a clear idea of what the point of studying English was that the question of its relevance or otherwise seemed barely to make sense. Literature wasn’t something that had to be mangled and picked at in order to connect to our lives. Instead, what we did in lessons was to talk about how the world was and what it was like to live in it; and it’s important to point out that children do that a lot anyway, possibly more than most people. Mark knew this and he knew that by its nature, literature is the most important and valuable guide there can be to that discussion. There are a couple of links to share. The first is a video made by Mark about the recent history of the school through the eyes of its outgoing headmaster Chris Goodwin (who, from what I’ve seen of the documentary, merits a thousand blog posts of his own). The second is a resources blog for his lessons, which is excellent reading for everyone, perhaps especially people who no longer have, or have never had, the benefit of going to Mark’s lessons three times a week. Both have been doing the rounds on Facebook, circulated by the many people who saw the deal that Mark Richardson was offering them and knew it was special. Cheers. Paul Gambaccini’s Radio 4 show ‘For One Night Only‘ is quite a rare thing: a radio show about (rather than playing) music that manages to avoid being joyless, self-indulgent and too long. Perhaps it helps that each episode is built around a specific historical event — usually, and in this case, a live concert. This helps to keep things focused and grounded, and there’s much less of the conceptual tangent-wandering you sometimes get with programmes about the arts. The episode I’m talking about is this one from 2008. It looks back at the BBC Prom of 21st August 1968, when (Russian) Rostropovich and the (Soviet) USSR State Symphony Orchestra played (Czech) Antonin Dvorak’s Cello Concerto, amid protests in London and calls for the concert to be cancelled. Why? Because, that day, Russian tanks had invaded Czechoslovakia. I would have loved to see Rostropovich play at any time, but this really would have been something else. It is often said that music, sport, culture in general, can and should be kept separate from politics. This concert is a powerful counterexample. Shouting in the audience, protestors outside, tanks in Czechoslovakia, and on the stage a tearful Rostropovich playing the music in such a way as to make it ‘completely clear whose side he was on’. The CD is available on BBC Legends, here, and now I’m going to buy it. But there’s a final, poetic sadness. On the recording that survives, the shouts of protest from some in the audience as the music begins have been removed. I’d take the original any day, sullied and tainted as it was by the low politics and human tragedies of its time. Just as live music should be. Quite a few people I know who use a Mac like to take advantage of the UNIX-like Terminal from time to time. I use it for remote logins to the computer clusters that do my PhD work for me, but there are all sorts things you can do using the built-in command line utilities, and for certain automated or repetitive tasks it’s often far quicker than using a graphical interface. I recently found a great application called TotalTerminal which takes control of OS X’s inbuilt Terminal app and allows it to bring up a terminal ‘visor’ just by pressing a shortcut, a bit like the console in iD Software games like Quake, Doom etc. This is very handy if you want quick access to the command line regardless of what else you’re doing at the time, and it’s very customisable too. I use ‘Apple+§’ to bring up a terminal from the bottom of the screen, so that I can quickly use SSH to check on my simulations. I don’t listen to many podcasts at all, but there is one that I’m so obsessed with that I sometimes can’t sleep without listening to an episode. The Peacock and Gamble podcast is hosted by comedians Ray Peacock and Ed Gamble, it’s about nothing in particular, it sometimes has regular sections (if that’s possible), it’s edited down to half an hour and it’s released every week for free. It’s probably best to start from somewhere near the first episode, and by the time you’ve listened to a few and made friends with Ray and Ed — which is very easy — it all makes sense. Unlike a lot of shows in this vein, it comes across as completely uncontrived. It’s just two naturally funny people who have great chemistry together, enjoying and exploiting the complete freedom the format gives them. Peacock and Gamble’s main website is here, and the podcast’s available from Chortle or iTunes. They’re currently doing a live show at the Edinburgh fringe, which is called ‘Peacock and Gamble’s Emergency Broadcast’. 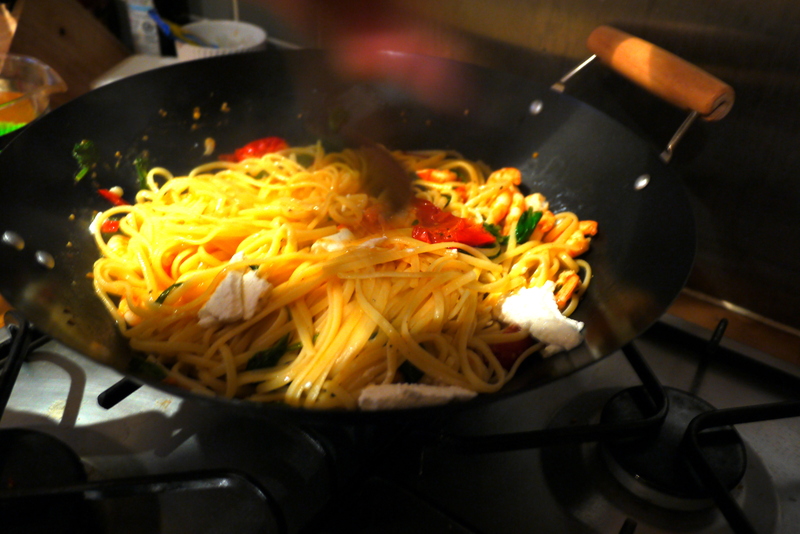 Here’s a picture of some pasta I made recently for my friends Mazep, Emma and Tom. It’s linguine with king prawns, tomatoes, and spinach. Also, there’s quite a lot of chilli, and some ricotta which I put in right at the end. Whenever I’m doing pasta with fresh tomatoes I find it’s best to get horribly expensive ones, even at the expense of other ingredients. Or, move to Europe for a bit.